My family loves this simple coffee cake and it is also great for company. Since the ingredients are straightforward, it’s likely that you’ll have the stuff necessary without making a special trip to the store. It’s easy enough to throw this recipe together while everyone is enjoying their first cup of coffee in the morning. When blueberries are in season, this is a great use for them and a special treat, but I also try to keep a stock of frozen blueberries hanging around as they work particularly well for this easy recipe. Preheat your oven to 350 degrees. Butter or grease a 9 inch springform pan (other pans may be used, but the springform makes it really easy). Sift together your dry ingredients (flour, baking powder/soda, salt. In your stand mixer, combine your butter and sugar. With the mixer running on slow speed, add your eggs, one at a time until combined thoroughly. Continue mixing by adding your milk, mayo, and vanilla until incorporated. Add your dry ingredients to wet and combine to remove any lumps. Pour half of the batter in your prepared pan. 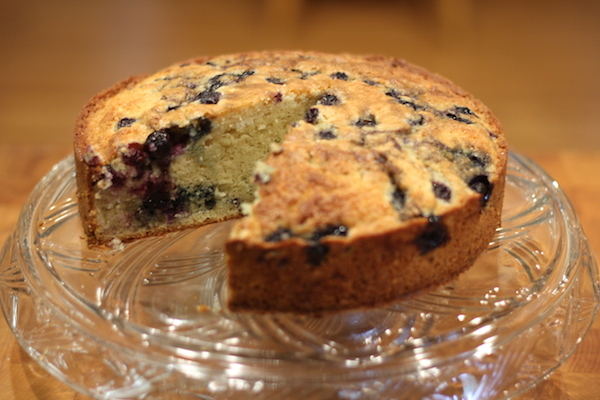 Sprinkle half of the blueberries on the batter. Pour in the rest of the batter and top with remaining blueberries and brown sugar. Bake for about one hour. The top should be browned and the middle should be set. Let cool for a little while prior to releasing it from the pan.